Headache occurs to each individual at some time or the other. It has many causes which are physiological or psychological, some of which are listed below. 1. Lemon: An equal proportion of lemon and ginger juice when consumed brings instant relief from headache. 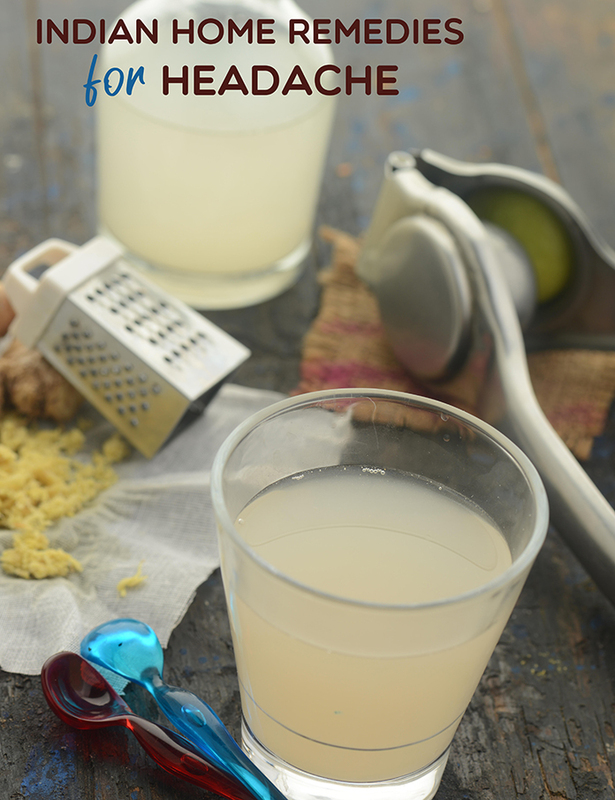 Try the recipe of Ginger Lemon Cup to overcome headache. 2. Turmeric (haldi) milk: One tsp of turmeric powder mixed in a glass of milk and boiled for 5 to 10 minutes is an effective remedy against headache. 3. Tulsi (Indian basil): Tulsi in combination with lemon is an age-old remedy for headache. 4. Cinnamon (dalchini): A paste made with cinnamon and water should be applied on the forehead 2 to 3 times every day. 5. Cloves (laung / lavang): A fine mixture of cloves and salt with water or milk is a common cure for headache. Apply the mixture on the forehead twice or thrice daily. •Fermented foods like dhokla, idli, dosa, cheese etc. The best therapy for a headache is one that suits the malady that it comes with. Here are a few ways that work well for most headaches. 1. Try and restrict the consumption of sugar. Though sugar in small quantities actually helps to cure headaches, excess sugar may trigger a headache or sometimes worsen an already existing one. 2. Consume plenty of fresh fruits and vegetables as they abound in vitamins A, C, E and B complex, zinc and iron all of which strengthen the immune system. Sources of these vitamins include green leafy vegetables (cabbage, spinach, broccoli), sprouts and red and yellow fruits and vegetables (tomato, orange, sweet lime, carrot etc.). 3. Avoid smoking as it can aggravate the headache. 4. Indulge in any activity you enjoy. Listen to music, go for a walk or cook as it keeps our mind and body fresh and alert. 5. A stress related headache will vanish with a warm oil head massage accompanied with a glass of warm Ginger and Lemon Cup.